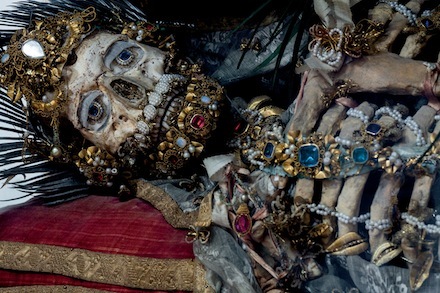 In 1578 the remains of thousands of individuals assumed to be early Christian martyrs were discovered in Rome. 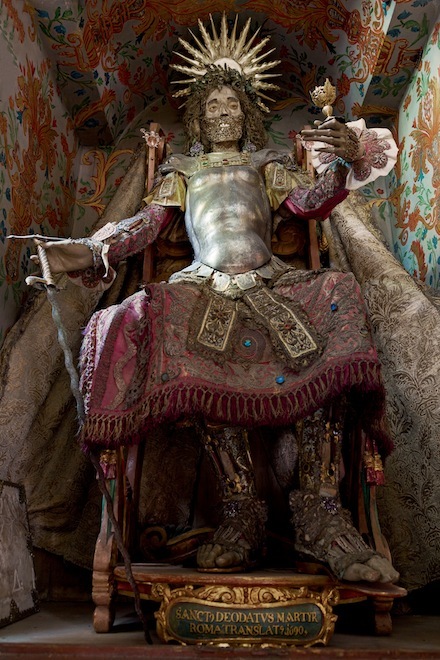 The remains were given fictitious names and sent to Catholic churches and religious institutions in German-speaking Europe as relics of saints to replace holy relics that had been destroyed during the Protestant Reformation. 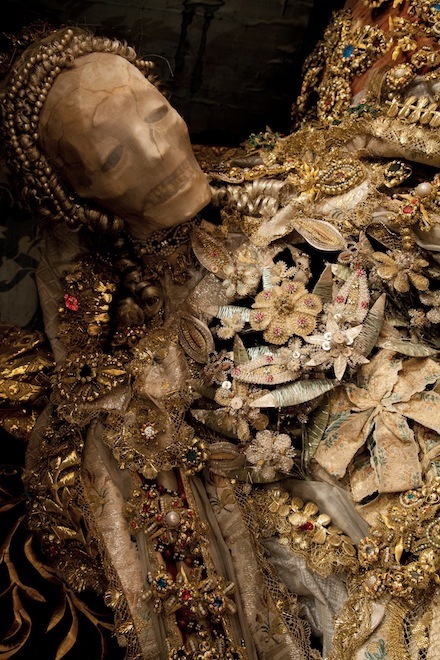 Reassembled by skilled artisans, encrusted with gold and jewels and richly dressed in fantastic costumes, the skeletons were displayed in elaborate public shrines as reminders of the spiritual treasures that awaited the faithful after death. 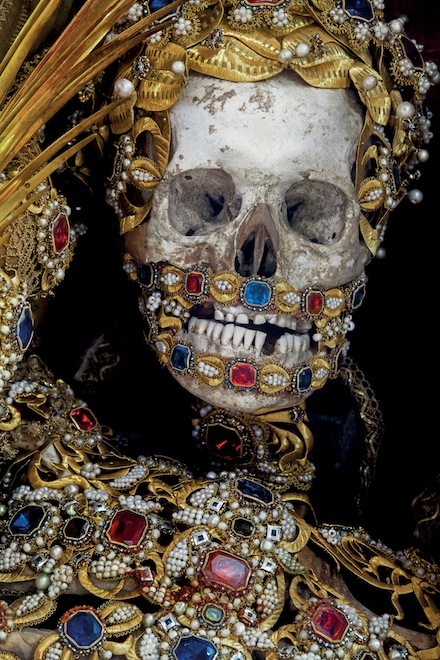 The arrival of the remains of St Albertus from the Roman Catacombs in 1723 was a source of great excitement for the parishioners of the church of St George in Burgrain, Germany, offering both a tangible connection to the early Christian martyrs and a glimpse of the heavenly treasures that awaited the faithful. Records concerning the decoration of St Valerius in Weyarn are incomplete, but similarities in technique with the relic of Albertus in Burgrain suggest that there may be a connection between the two. 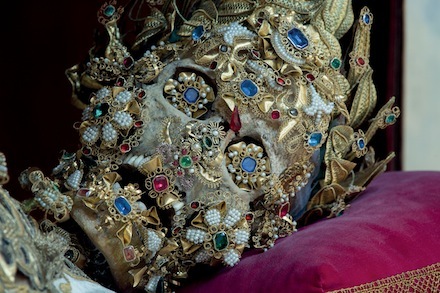 The relic of St Deodatus in Rheinau, Switzerland, is an example of an unusual reconstruction technique in which a wax face was moulded over the upper half of the skull and a fabric wrap used to create a mouth. St Luciana arrived at the convent in Heiligkreuztal, Germany, in the mid-eighteenth century and was prepared for display by the nuns in Ennetach. 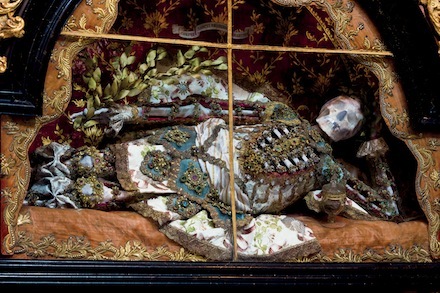 St Friedrich at the Benedictine abbey in Melk, Austria, is presented in a typical reclining pose and holds a laurel branch as a sign of victory. 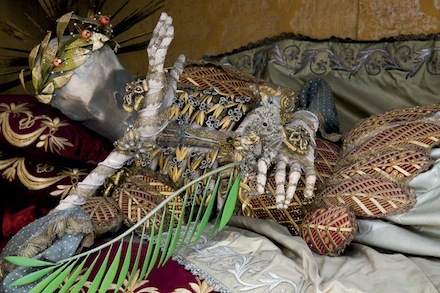 In Stams, Austria, the ribs of St Vincentus are exposed beneath a web of golden leaves’ the hand raised to cover the face is a gesture of modesty.